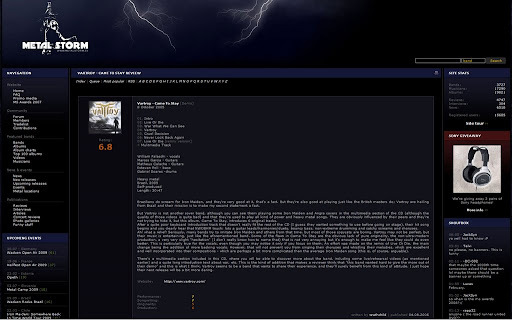 O site Francês METAL STORM publicou um ótimo review sobre o cd CAME TO STAY da banda VARTROY. Brazilians do scream for Iron Maiden, and they're very good at it, that's a fact. But they're also good at playing just like the British masters do; Vartroy are hailing from Brazil and their mission is to make my second statement a fact. But Vartroy is not another cover band, although you can see them playing some Iron Maiden and Angra covers in the multimedia section of the CD (although the quality of those videos is quite bad) and that they're used to play all kind of power and heavy metal songs. They are obviously influenced by their peers and they're not trying to hide it, but this album, Came To Stay, introduces 6 original tracks. After a quite poor keyboard introduction track that doesn't really fit the rest of the CD (I guess they wanted something to use before going on stage), their hit song begins and you clearly hear that NWOBHM touch: lots a guitar leads/harmonies/duets, bouncy bass, non-extreme drumming and catchy screams and choruses. Ah! what a relief! Seriously, many bands try to imitate Iron Maiden and others from that time, but most of those copycats are boring. Vartroy may not be perfect, but their music is entertaining, just like the aforementioned band. Some of the flaws in Came To Stay are the obvious lack of pure originality, the non-ultra-modern production, a very very slight "hesitation" (I don't really know how to name that) that is not very annoying but it's enough to make me feel like they could do even better. This is particularly true for the vocals, even though you may notice it only if you focus on them. An effort was made on the remix of Live Or Die, the main change being the addition of more backing vocals. However, that will not prevent you from singing their choruses and whistling their melodies, which are excellent and well incorporated into their compositions - which are perhaps a bit more complicated than the average Iron Maiden song (this is, of course, arguable). There's a multimedia section included in this CD, where you will be able to discover more about the band, including some live/rehearsal videos (as mentioned earlier) and a quite long introduction text about war, etc. This is the kind of addition that makes a reviewer think that "this band wanted hard to give the more out of their demo" and this is what I think, Vartroy seems to be a band that wants to share their experience, and they'll surely benefit from this kind of attitude. I just hope their next release will be a bit more daring.